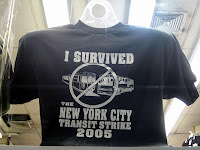 City Transit Workers, MTA Ready to Part Ways Like It’s 2005? It’s probably too soon to overreact and either a) go shopping for a fresh pair of really comfortable walking shoes, or b) leave town as quickly as possible — but this morning’s protest of hundreds of transit workers in Midtown probably seemed eerily familiar to anyone who lived through the Great Subway and Bus Strike of Aught Five. The Daily News reports that around 350 transit workers descended on a one block area of Madison Avenue earlier today to protest the MTA’s decision to challenge a contract, brokered in arbitration, that would raise hourly pay rates for workers more than 11-percent over three years. The workers say the deal was already approved by both sides and that management’s trying to back out. The MTA says the arbitration panel made factual mistakes and wants a judge to throw the whole thing out — it says the contract as it stands would wind up adding $350-million to the budget. Back in 2005, transit workers illegally walked off the job for three days, bringing the city to a standstill. So are we headed for another walkout?